The National Semiconductor LM 1578 A is a switching regulator which can easily be set up for such dc-to-dc voltage .conversion circuits as the buck, boost, and inverting configurations. The LM 1578 A features a unique comparator input stage which not only has separate pins for both the inverting and non-inverting inputs, but also provides an internal 1.0 V reference to each input, thereby simplifying circuit design and PC board layout. The output can switch upto 750 m A and has output pins for its collector and emitter to promote design flexibility. An external current limit terminal may be referenced to either the ground or the Vin terminal, depending upon the application. 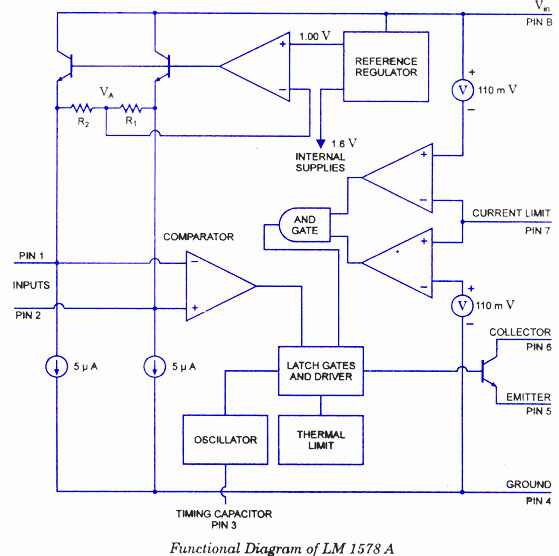 In addition, the LM 1578 A has an on board oscillator, which sets the switching frequency with a single external capacitor from < 1 Hz to 100 kHz (typical). It operates from supply voltages of 2 V to 40 V. It is provided with current limit and thermal shutdown. Duty cycle up to 90 %. Functional diagram is given in figure.